Looking to rent gear, hire us for our production services, or just curious about what types of tools we use? Below is a list of the gear that we own and use on a regular basis. (1) Black Magic Ursa Mini Pro 4.6k (EF and PL mounts available). Internal Prores and raw recording up to 4.6k at 60 fps. Matthews 24X36" flags, silks, mafer clamps, collapsible reflectors, gels, diffusion, light stands, c-stands, etc. Custom built 8 core i7 workstation, professional Eizo 27" color correction monitor. Our main cinema camera. 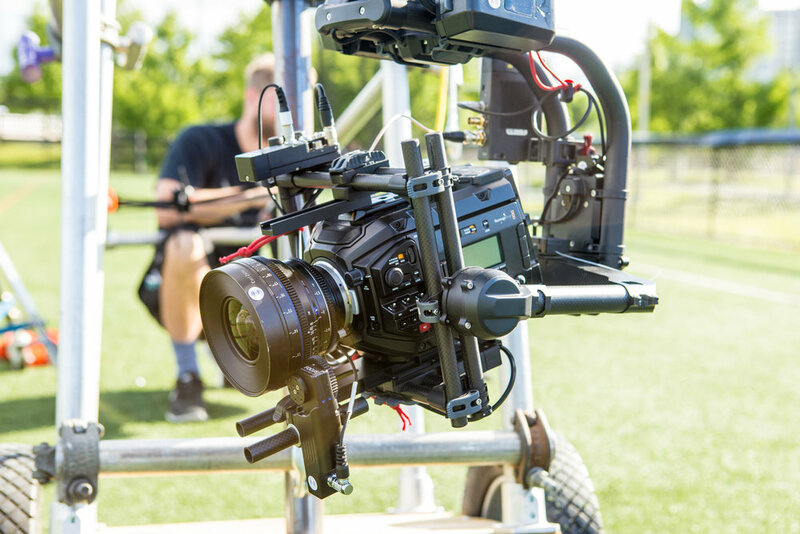 The Black Magic Ursa Mini Pro 4.6k on a borrowed Movi Pro, Canon CN-E lens, Teradek Bolt sdi transmitter, and RT Motion wireless follow focus. Kino Flos and Aputure LED's used in this interview setup. First A.C., Zack Camburn, getting his focus marks and monitoring with our Atomos Inferno. Political ad: straight to camera portion of video. Shoulder mount setup for Ursa Mini while using the Atomos Inferno as a director's monitor and for recording redundancy. Testing out some Red Pro Primes with the Ursa Mini Pro's swappable PL Mount.